Improves concentration & memory in condition such as stress, anxiety, tension, behavioural disturbances, sleeplessness, hysteria etc. Improves concentration & memory in condition such as stress, anxiety, tension, behavioural disturbances, sleeplessness, hysteria etc. 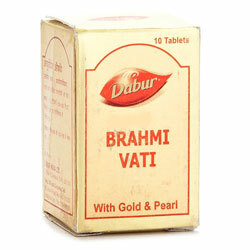 It helps in strengthening nervous system. 1 to 2 tablets to be taken in the morning and evening with Honey or as directed by the physician.